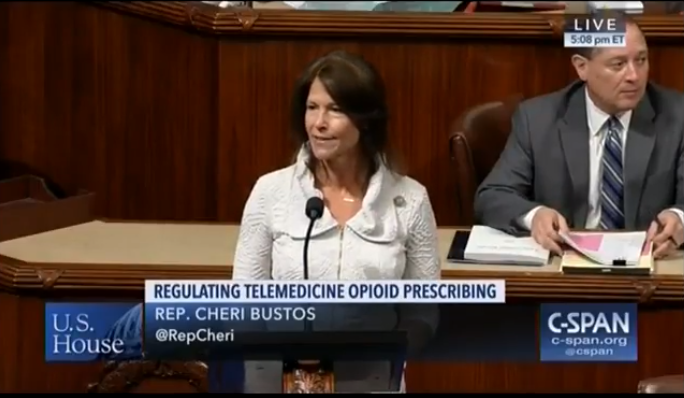 Washington- Today, Congresswoman Cheri Bustos (D-IL) took to the House floor to speak on the Special Registration for Telemedicine Clarification Act, which passed with bipartisan support. Congresswoman Bustos introduced this legislation with Congressman Earl L. “Buddy” Carter (R-GA) to increase access to treatment for those suffering from addiction. Small towns and rural communities across America have been hit especially hard by the opioid epidemic due to unique barriers to recovery. Only 55% of rural counties have substance use disorder treatment facilities, which makes access to telemedicine vital in combating the opioid epidemic. However, current federal law prohibits a medical practitioner from dispensing controlled substances through the internet without first evaluating the patient in-person. The Special Registration for Telemedicine Clarification Act instructs the Attorney General to take the necessary steps to allow for the prescription of medication-assisted treatment (MAT) and other controlled substances via telemedicine. Specifically, the bill will lead to the implementation of a special registration process for physicians to prescribe such treatment, helping connect patients with the treatment they need without risking important safeguards to prevent misuse. The opioid epidemic has claimed the lives of too many across our nation. Although no corner of our country has remained unscathed, the crisis is worse in rural America where drug related deaths are 45% higher. When I travel around my district, I am told time and time again, that access to treatment remains one of the largest barriers to recovery in many of the small towns and rural communities I serve. We don’t have enough doctors, we don’t have enough treatment centers, and if we don’t have those things, too many people don’t have a chance. That is why I worked with my colleague from Georgia, Congressman Buddy Carter, to introduce The Special Registration for Telemedicine Clarification Act with Democrats and Republicans working together. This bill is a common sense measure that cuts through red tape to provide more treatment options to underserved communities through telemedicine. Saving our sons and daughters from this epidemic is a bipartisan priority, and I urge my colleagues on both sides of the aisle to support this legislation. In 2008, Congress strengthened prohibitions against distributing and dispensing controlled substances by passing the Ryan Haight Online Pharmacy Consumer Protection Act (P.L. 110-425). The Ryan Haight Act made it illegal for a practitioner to dispense controlled substances through the internet without at least one in-person patient evaluation. The law allows for the Attorney General to create a special registration to health care providers to prescribe controlled substances via telemedicine in legitimate emergency situations, such as a lack of access to an in-person specialist. However, the special registration process has never been implemented, leaving some patients without access to treatment. The Special Registration for Telemedicine Act will direct the Attorney General to take action on the special registration and allow physicians to prescribe medication-assisted treatment via telemedicine.